Camp Ladore is owned and operated by The Salvation Army. Situated among the picturesque mountain ranges of Northeast Pennsylvania, it consists of approximately 1,200 acres surrounding a 265 acre lake. Our Summer Camp programs take full advantage of these natural resources for contributing to the spiritual, educational, social, and recreational needs of every camper. Click here to learn more. Each summer, hundreds of campers ages 7 to 16 travel from across Pennsylvania and Delaware to attend a week at camp. 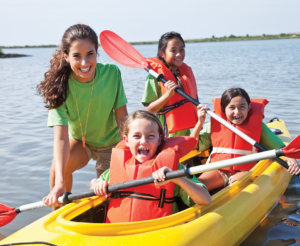 A wide variety of activities are offered, including: nature study, swimming, horseback riding, boating, arts and crafts, sports, fishing, music instruction, archery, hiking, games, high ropes course, and more. An integrated Christian Education program provides opportunity for spiritual decision and growth. For many children, Camp Ladore offers a truly life-changing experience. To promote awareness of God, His love, and through the love of Jesus Christ, to aid toward spiritual growth and knowledge of basic human values. To give children, youth and adults a fun-filled, healthful, safe, educational and inspirational experience in the out-of-doors. To help develop an understanding, appreciation, and a sense of stewardship for the out-of-doors, for the natural environment, and for all living creatures. To help individuals grow in understanding themselves and each other, and especially for children to experience relationships with staff as caring adults and to offer opportunity for people of varied cultures to develop compassion for each other. To provide a loving and supportive environment where families can learn to cope with and solve their problems. To facilitate creative self-expression through worship, song, work, play, physical activity and the development of new skills. To allow each person to participate in planning programs and in establishing limits and responsibility for the safety and welfare of all. To assist in developing an appreciation of the wonder and joy of the miracles of everyday living. Camp Ladore stands ready to meet these goals, providing campers with an incredible camping experience through direct supervision and interaction with a mature, well-trained staff. We are accredited through the American Camp Association and have welcomed campers each and every summer since 1967. Imagine what a week at an overnight summer camp could do for a child immersed in the great outdoors! Click here to learn more.